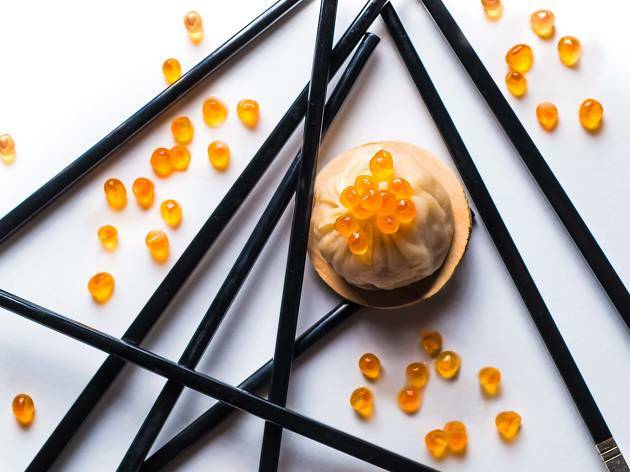 Nothing screams Hong Kong Art Month quite like the annual onslaught of art-inspired menus that unite the world of art and food in one meal. Local and international artists have converged on Hong Kong to participate in the many exciting art events this month. 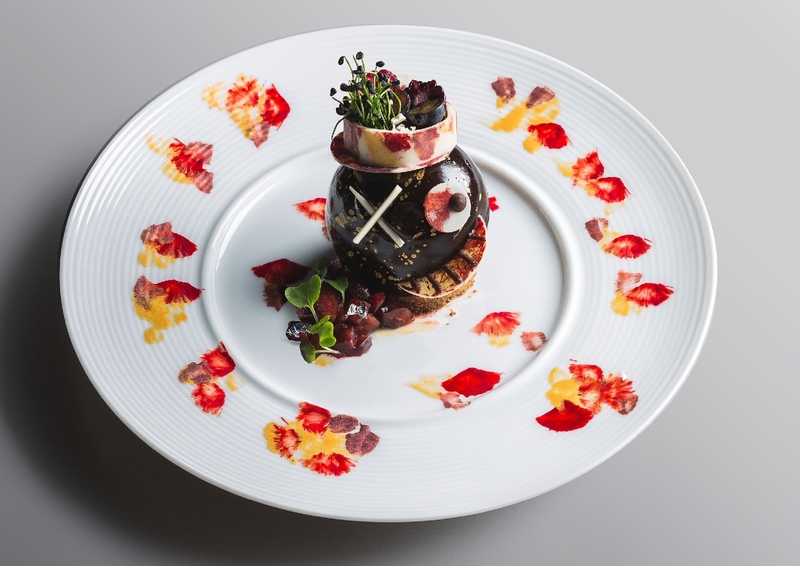 And many chefs, too, have taken up the challenge to present beautiful culinary creations inspired by renowned painters and iconic artworks. This is our selection of some of the best offerings inspired by art. Prefer enjoying art without consuming it? Make a visit to the Hong Kong’s best art galleries and street art spots. 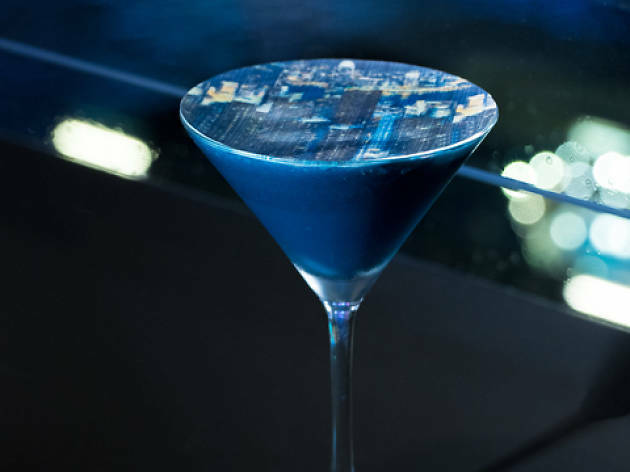 In celebration of Hong Kong Art Month, TST’s Above & Beyond has crafted several art-inspired cocktails that pay homage to selected local artists and designers, including Kim Sungho and Janko Lam. This Cantonese restaurant is renowned for its view of the Island skyline, so it’s appropriate that you can drink in the view in more ways than one. 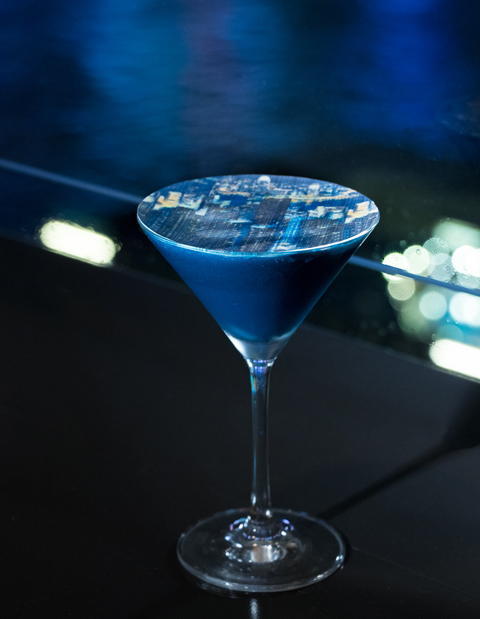 The Pearl of the Orient ($65), featuring an edible topping representing the HK skyline by Kim, is a delectable blue cocktail made with sloe gin, Peachtree liquer, ‎Curaçao blue, as well as egg white and cream. March 24-31. 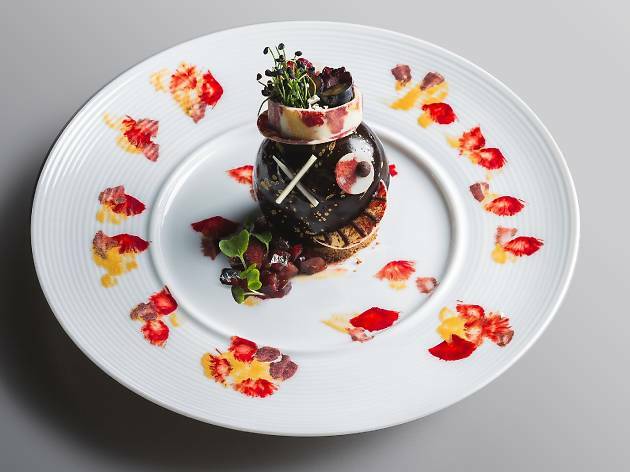 As part of Lan Kwai Fong’s Savouring Art programme this month and to celebrate internationally renowned street artist André Saraiva’s exhibition at Loft 22, Cé La Vi is one of 12 restaurants creating a limited edition tasting menu inspired by the Swedish artist’s works. 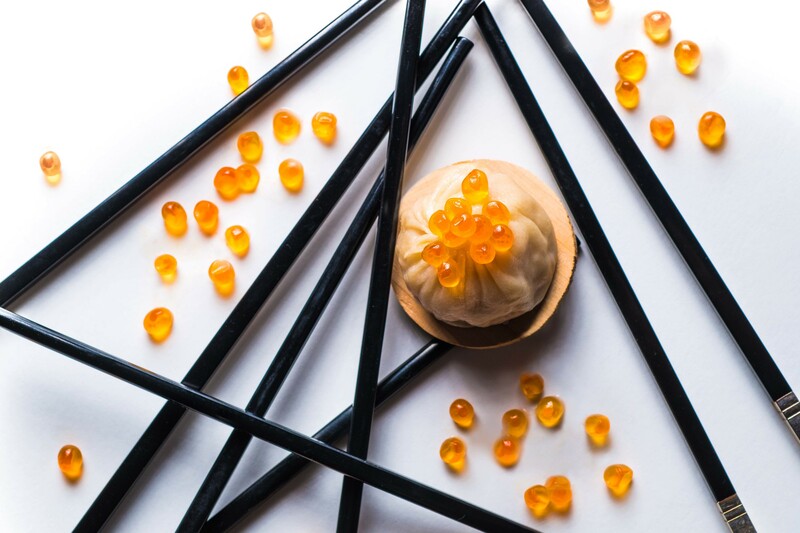 Transposing Saravia’s iconic Happy Culture motif – a round-headed stick figure with crosses for eyes – executive chef Jason Au has designed a black coloured coffee mousse decorated with the happy face motif and is serving it on a white plate (a truly revolutionary idea) to enhance the colour contrast. Get ready to smile as you tuck into this one. $550 per person. Until March 31. This Landmark speakeasy is known for housing more than 250 premium gins from all around the world. Determined to put its collection to good use, Dr Fern has concocted the eye-catching Zoetrope ($150). 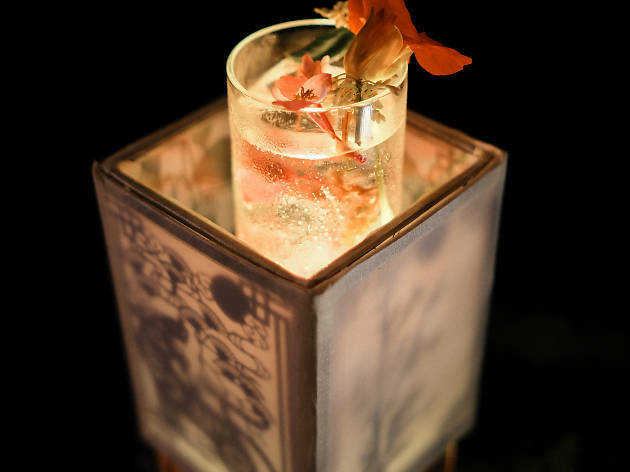 Inspired by traditional Chinese horse lamps – used to create the illusion of animation back in the fourth century – sip and savour this gin concoction served with Dr Fern’s signature long ice, topped with photogenic frozen flowers and served inside one of the aforementioned lamps. Until March 30. Like Cé La Vi, Mexican restaurant/bar Los Sotano is participating in the Savouring Art campaign. 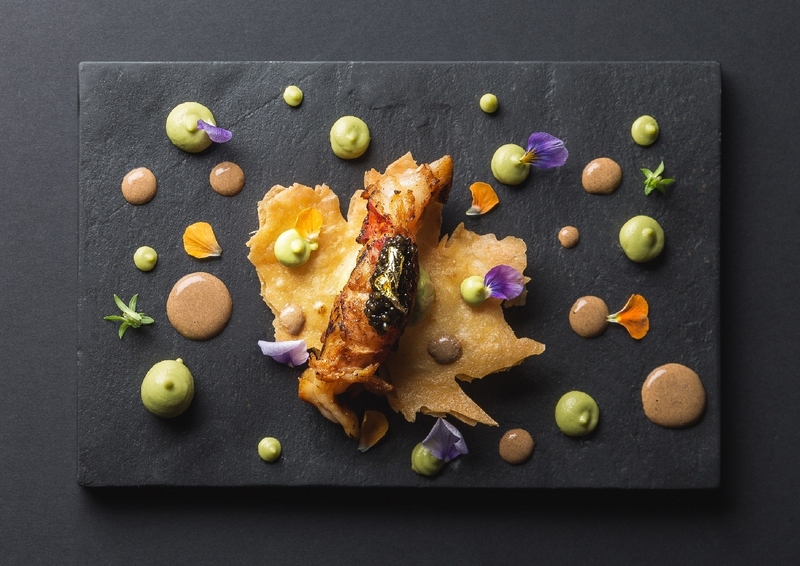 Dig into an entire artsy menu that includes a ‘lobster drunk on caviar’ – a tequila-marinated lobster served on top of a crunchy tostada, with garnish and sauce dotted all over to create a palette effect. 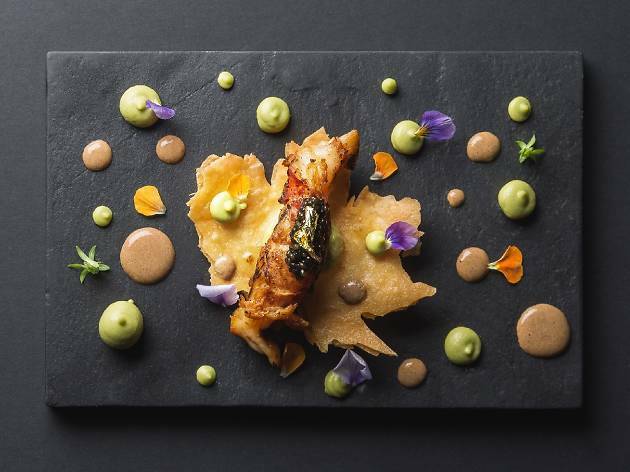 Inspired by Saraiva’s Happy Culture series, expect other colourful dishes that scream joie de vivre. $550 per person. Until March 31. 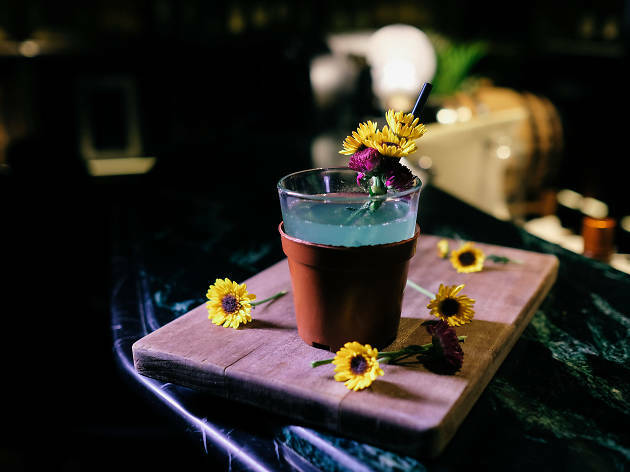 Paying homage to legendary artists Rob Pruitt and Vincent Van Gogh and renowned fashion houses Jimmy Choo and Louis Vuitton, Mrs Pound is going all out with two new creative cocktails. The first (pictured), Van Gogh x Louis Vuitton ($120), is an interpretation of the impressionist’s iconic Sunflowers painting in liquid form. 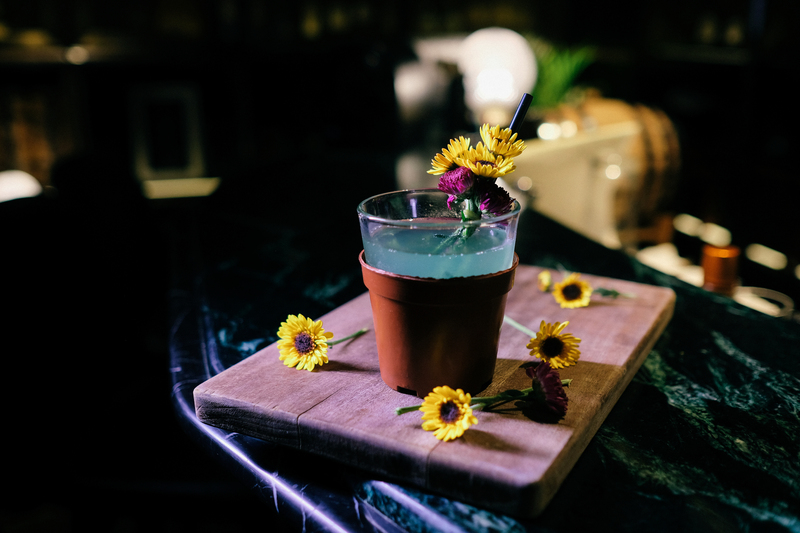 Served in a miniature flowerpot, the vodka cocktail is also garnished with small chrysanthemum flowers. Also created specially this month is the Rob Pruitt x Jimmy Choo ($120), a soft green cocktail made with rum topped with white foam served in a ceramic sampan glass that comes with an edible wasabi-caramelised basil leaf. Creating artworks that happen to contain cocktails rather than presenting art-inspired drinks, The Woods has just launched a series of six sculptural drinks in celebration of their new bar-within-a-bar concept, The Lodge. Taking inspiration from contemporary artists such as Alexander Calder, Olafur Eliasson and Andy Goldsworthy and combining it with copper glassware designed by Tom Dixon, these new cocktails have taken drinks to a whole new level. One of the must orders is Starburst ($150), a concoction inspired by star anise that incorporates a five-spice and dried fruit Johnnie Walker Black Label infusion, Hennessy cognac, homemade nut soda water, and orange-scented ice. 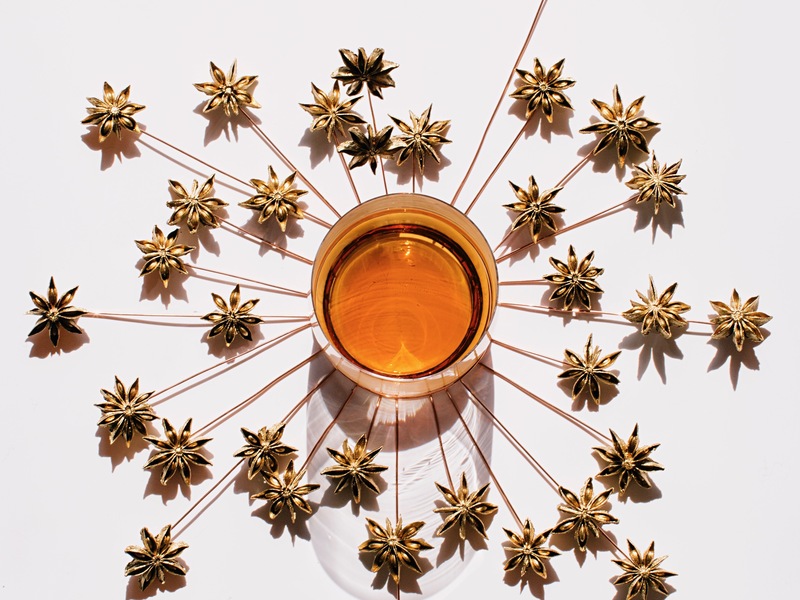 The star anise used in the infusion are also painted gold and made into a sculpture with copper wires. Until May 21. 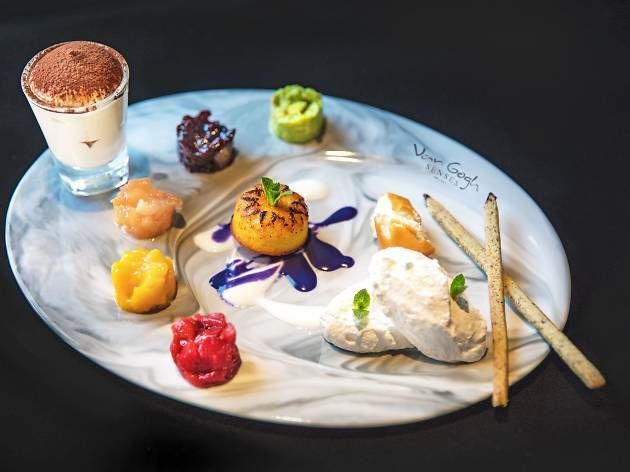 Faber-Castell and Van Gogh Senses – a local restaurant and retailer that offers Van Gogh inspired menus and products – have joined forces to create a special afternoon tea set that invites diners to get creative with their meal. 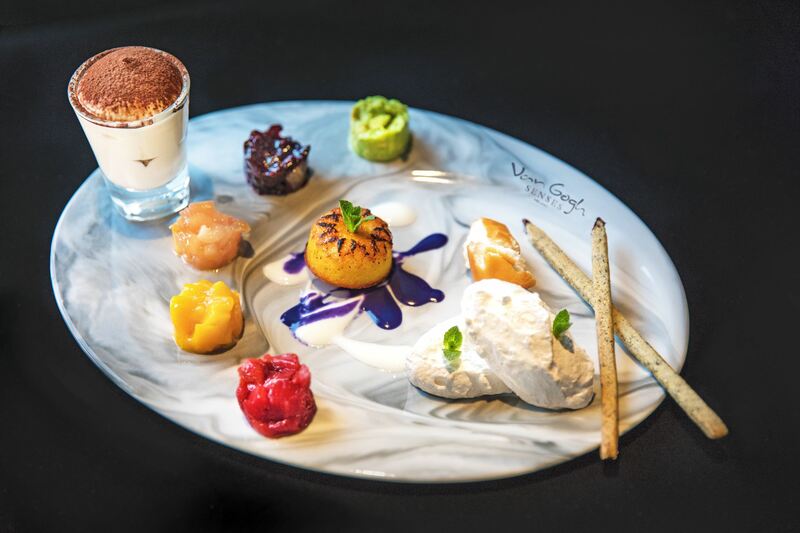 Beautifully plated like a paint palette, pick up a black sesame pencil and dip it into a selection of fresh fruit compotes such as strawberry, mango, peach and rhubarb, and yuzu and avocado. 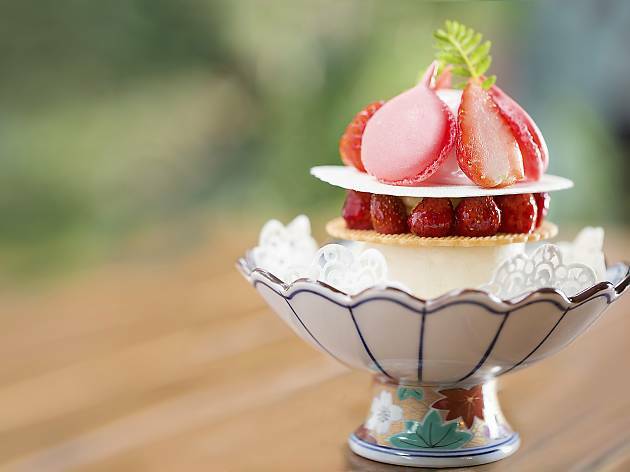 The tea set also comes with a coconut pavlova, a brightly hued orange sticky cake and a creamy tiramisu. Bonus: you get to take home a set of two Faber-Castell 9000 pencils – the type used by Van Gogh himself. Until March 31, 3.30pm-5.30pm. $228. 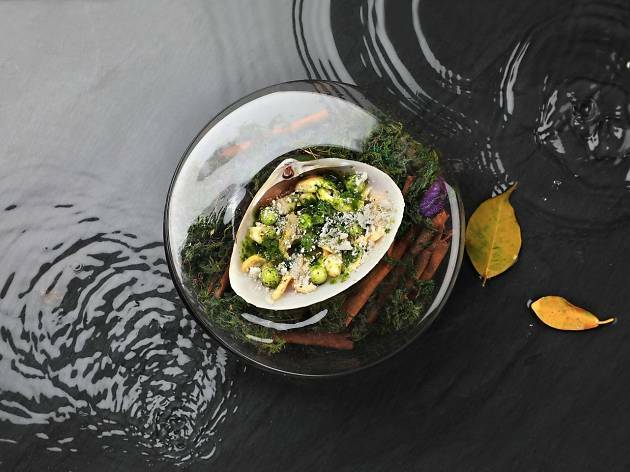 Get ready to chow down on an eye-catching six-course degustation menu at Whisk this month. Using the imagery of forests and oceans as base, the fine-dining venue has expertly created gourmet landscapes via aroma and colours. 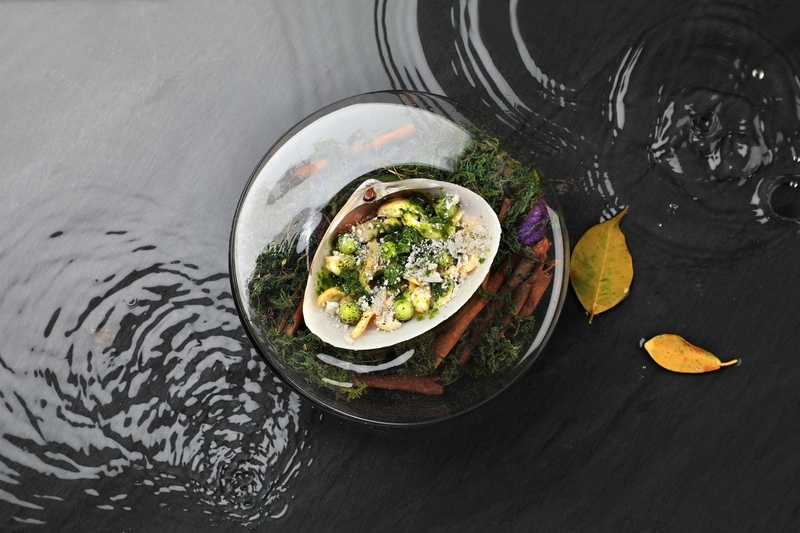 Expect innovative presentations like clam served in a seashell to represent the breeze, and duck with burdock root and mushroom to represent forest. March 23-April 14. $690 (four course), $890 (six course). It’s nearly sakura season! To celebrate the cherry blossom in Japan and Art Month, floral artisan Kirk Cheng has created a site-specific sakura installation, inviting diners to sip cocktails and tuck into artsy dishes beneath a floral canopy. 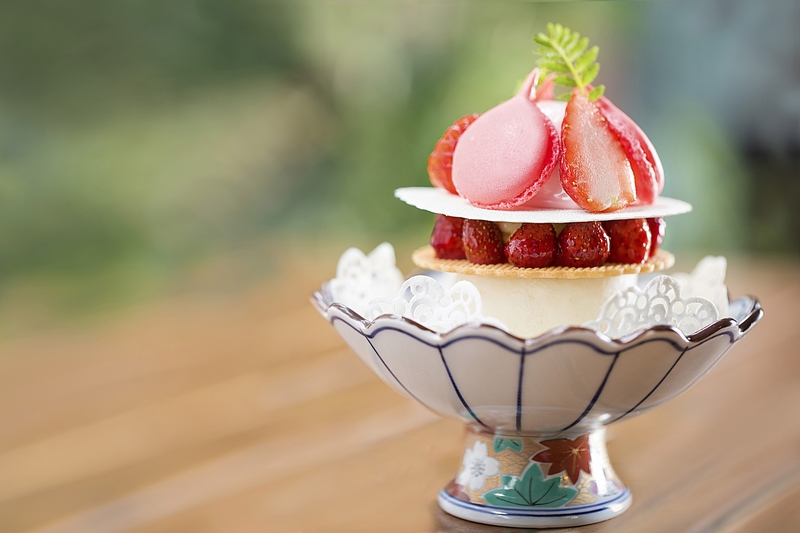 Have a go at the Japanese sakura cheesecake ($178), a beautifully stacked dessert made with seasonal wild strawberries, home-made wasanbon cookies, Hokkaido cheese and sakura ice cream. 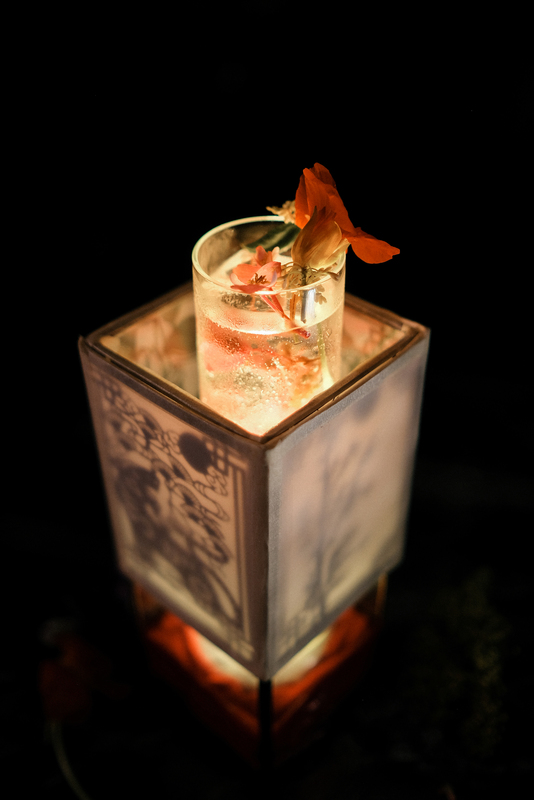 Creative tipples also worth trying are the Hanami Martini ($120) and the Sakura Sour ($120). Both are pink in colour and feature appealing decorations that makes for great Instagram shots. Until April 30. Hong Kong is a city full of delightful desserts. 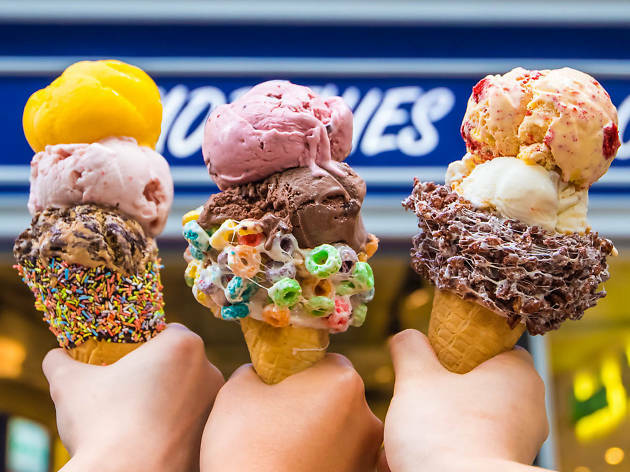 Here are Hong Kong’s best-looking puddings, whether you’re into kakigori shaved ice, egg waffles, ice cream or cakes.